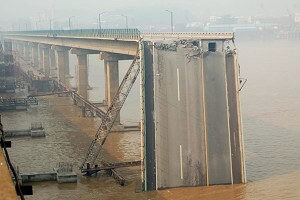 On June 15, around 5:10 a.m., a sand freight boat hit one pier of the Jiujiang Bridge in Foshan, Guangdong. Part of the bridge broke and sank into the river. The sand freighter also sank into the river with two of the ten man crew rescued sustaining minor injuries. According to Ming Pao Daily News , there were also two construction workers on the bridge when the accident happened. Both have been identified as missing. According to a report of vehicles passing the bridge toll, six drivers have also been classified as missing. Commenting on the accident, a BCC broadcast quoted a bridge design engineer as saying the construction of a bridge in a first class water way should have the lifespan of 100 years. If a 1,000 ton sand freighter could so easily break the piers, it probably resulted from major structural defects in the design and construction of the bridge. The bridge was built in 1988 and is a part of No.325 State Highway, connecting Foshan City and Jiangmen City in Guangdong Province. It is a major traffic route used to enter West Guangdong. After the incident, the traffic department sealed off Jiujiang Bridge. Vehicles going in and from West Guangdong have been detoured to Fokai Freeway.